Kate's Place-Enjoy a Vintage Victorian w/all modern Amenities-EZ walk to town!!! 'Kate's Place' is a 4 Bedroom, 2 1/2 BA 1891 Victorian Home which has been meticulously restored & decorated to reflect it's unique heritage, with all modern amenities, & within EZ walking distance to historic downtown Grass Valley (1/2 mile) & Empire Mine State Park (1/3 mile to West walk-in entrance, 1 mile to Main entrance). An excellent location for a romantic getaway, group gatherings, etc. We can comfortably accomodate 8-10+. We are confident you will enjoy the comfort & ambience of our lovely Victorian home on Historic Kate Hayes St.
We have strived to maintain a comfortable environment for our guests with 4 bedrooms: 1 large Master with Cal King Bed, 1 Queen bedroom & 2 bedrooms with 2 twins each with superior quality linens, towels & amenities provided; formal dining room & breakfast nook; comfortable living room with satelite TV & video cassette/DVD player with video library; free wireless hi-speed internet. Just bring your clothes & personal items & enjoy your stay. WHY STAY IN 2-4 B & B/HOTEL ROOMS WHEN YOU CAN RENT OUR ENTIRE HOME FOR LESS THAN 1 OR 2 ROOMS????????? There are numerous supermarkets nearby if you wish to utilize our gourmet equipped kitchen &/or BBQ areas to prepare your own meals to enjoy in the formal dining room or breakfast nook. Professional Waffle & Ice Cream makers are available for your enjoyment. A Crock Pot for throwin' in the goodies in the AM & it'll be 'cookin' while you're out cruisin'', with dinner ready when you return! Bring your favorite recipes or use one of ours, you'll love 'em & we've got a bunch with all the 'how to' info necessary. We have both gas & charcoal BBQs & outdoor seating/dining facilities in our lovely patio/gazebo garden area. It's hard to know where to start when describing the almost endless activities available in Grass Valley/Nevada City & the surrounding area. We are approximately 1 hour drive to Sacramento or Lake Tahoe. Numerous excellent lakes, rivers & streams within minutes, wineries/wine tasting, museums, antique shops & specialty shops galore, walking tours, Empire Mine State Park (just up the street! ), County fairgrounds activities (1-1/2 miles), fly fishing, excellent local restaurants, etc., etc., etc. Drive up Hwy 49 thru Downieville & Sierra City & experience the beauty of the fall colors that rival (many say surpass!!!) the northeastern United States in their splendor. Additionally, there are more great restaurants & excellent picnic sites along the streams & rivers that flow alongside the highway. Even snow play activities are nearby in the winter along with skiing less than an hour away. We could go on & on, but suggest checking out OUR WEBSITE (see below) &/or contacting Grass Valley &/or Nevada City Chamber of Commerce (click the Links on our website) for an even more complete list of events & dates. COME STAY & PLAY!!!! My wife & I are native Californians, born & raised in the Central Valley & Bay Area, respectively. Our daughter & son-in-law moved to the Grass Valley area a few years ago & when visiting we fell in love with the area also. We now have our youngest grandson, born in May, 2009, & our newest granddaughter, born in May, 2011, to bring us here for numerous visits. We purchased our vacation home on Kate Hayes St. in April, 2008 & enjoyed so much furnishing & decorating it that friends suggested we share it as a vacation rental with others. We were reluctant at first but found that it has worked out so well & folks that have stayed have been so nice & appreciative of the home and all the surrounding area has to offer. There are so many activities & fun things to do in & around the beautiful Grass Valley/Nevada City area that it would be impossible to list them all. The Cornish & Victorian Christmas, Car shows, farmers markets, theatre, rivers, lakes, excellent wineries, Empire Mine State Park, etc., etc., etc. We originally purchased the home for our own enjoyment & for a place to 'getaway' & enjoy family & our Grandson, Trye, born May, 2009 & our newest Granddaughter, Kyla, born May 2011. We've also found that we really enjoy sharing our home with others. Our Victorian home is exceptionally comfortable, especially considering its' age. Built in 1891, it has been meticulously restored & we have decorated & furnished our home to help preserve its' unique heritage & to make it just as comfortable for our guests. We especially enjoy sitting out on the front porch & chatting with neighbors as they walk by on our narrow little lane, Kate Hayes St., named after the famous Irish Opera singer, Catherine Hayes, who was born in Limerick, Ireland in 1818 & enjoyed an illustrious career singing & performing around the world & in the Gold Country & particularly in the Grass Valley/Nevada City area. So, as you can tell it was a 'no-brainer' to name our home 'Kate's Place'!!!! Delightful home -- the owners have worked very hard to maintain the character of a Victorian home with many special touches -- be sure to look at the upper "curtain" over the kitchen sink! Very comfortable, clean and lots of character. The owners are delightful and care about your visit. One caution -- be aware of the outside stairs if they are damp or frosty -- they can be slippery! We will definitely suggest this delightful home to family and friends! Thank you for caring so much about our stay! This house looks small but boasts 4 bedrooms and plenty of room for a couple of families. We enjoyed the trails at Empire Mine State Park and walked to Mass at St. Patrick's Church and breakfast at Tofanelli's. The shower in the master bedroom had great pressure and was really hot - just the way I like it! I hope to stay in this lovely home again when I go to visit my family in Grass Valley. Myself and 7 family members stayed in this wonderful home for 2 days and nights recently. My family had flown out from Boston for my daughter's wedding at the Empire State Mine Park. Kate's Place was perfect for us! The bedrooms had enough separation for family to take a nap without being disturbed by those of us in communal areas. The back yard is such a wonderful grotto, it was just the right touch of 'kitschy' with garden sculptures, and European flair. With our ages ranging from 21 to 64, we all had privacy and space when we wanted it. Being so close to the park was very helpful in getting to the rehearsal and wedding. I only wish we had stayed longer! Great Place to Stay in Grass Valley !!! We recently had our "Three Sisters Reunion" at Kate's Place. Very sweet vintage house. Roomy enough for seven of us to not feel crowded at all. Very clean. Loved the furnishings. Had everything we needed, including a great little patio area to enjoy visiting and meals. 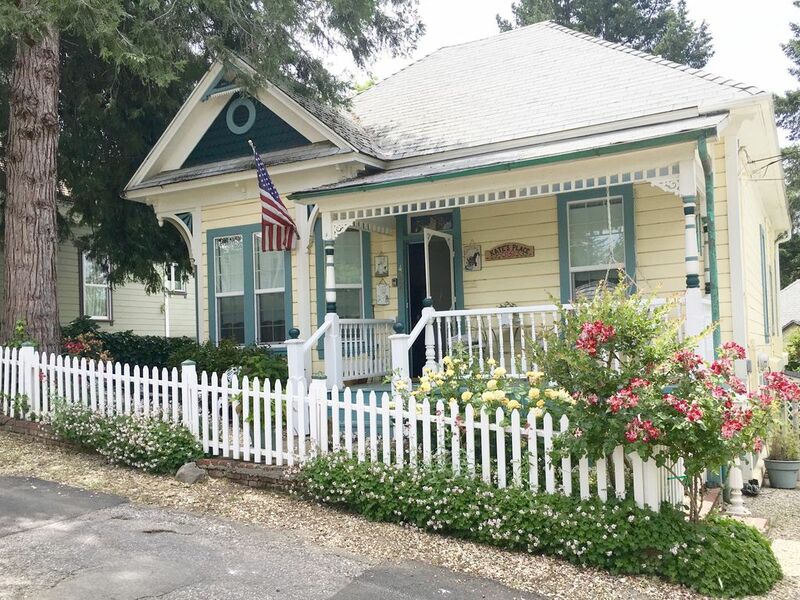 And, it's just a short walk to Grass Valley's Historic District. We all loved staying at Kate's Place and highly recommend it! Thanks so much JoAnne. We really do love sharing Kate's. We've been blessed with great guests over the years & really appreciate it when we hear such nice words. This was the perfect house for our annual get together. We are 8 ladies who went to high school together and have been getting together once a year for the past 31 years. We all loved the house. The décor is wonderful, the beds very comfortable, and great location. Thank you for sharing your home. Terrific house in a nice, quiet neighborhood. Easy walk to town. Charming furnishings. The owner was highly responsive. We would gladly stay here again next time we’re in the area. ***Bring your best Waffle or Ice Cream recipe (we have 'em if you don't) to use in our Professional Waffle Maker or Ice Cream Maker, respectively, of course!!! ***Crock Pot/Slow Cooker-throw in your favorite goodies in the AM & it'll be "cookin' while you're out cruisin'" & dinner will be ready when you return!!!! ***Weber Gas BBQ on back porch for quick dinners inside (& when it's raining/snowing) AND Weber Charcoal BBQ w/gas starter on patio for wonderful Spring/Summer/Fall evenings on the Patio!!!!! ***Fees: *Rates subject to change until Reservation confirmed *Pet Fee= $50/pet for stays of up to 7 days. Additional charge may apply for more than 7 day stay! *$20/night per additional guest above 6 *Cleaning charge=$125+/- (Deducted from Damage/Security Deposit) *Holidays/Special Events not noted above may be subject to different rates!